Rancho Cordova, Calif. — VSP® Vision Care, a VSP Global® company, and the largest and only national not-for-profit vision benefits provider, has once again been recognized for delivering excellent customer service by Service Quality Measurement (SQM). For the 15th consecutive year, VSP’s call centers received Contact Center World Class Certification from SQM. The honor is shared with VSP Global’s Marchon Eyewear Inc., one of the world’s largest manufacturers and distributors of quality eyewear and sunwear. Each year SQM conducts surveys of customers and employees of more than 500 North American contact centers. To achieve World Class status, among other criteria, a call center must perform at 80 percent “top box” satisfaction level or higher. In 2016, VSP Vision Care performed at 88 percent, while the average World Class Call Centers trailed behind at 82 percent. “Our representatives receive up to 80 calls each day, and the fact that more than 99 percent of those inquiries are resolved in the same day just goes to show the dedication behind ensuring each call is treated as a top priority,” said Kathy Rodine, Vice President of VSP Customer Care. 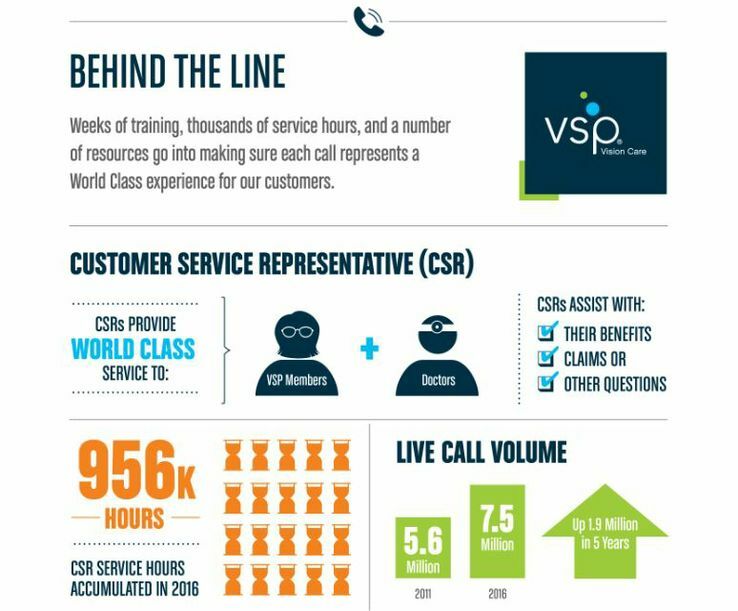 View our ‘Behind the Line’ infographic to get a snap shot of the VSP contact center process and what goes into delivering a world class experience. VSP and Marchon will accept their awards at SQM’s 18th Annual Contact Center Industry Conference held in Vernon, British Columbia on May 2-5, 2017.